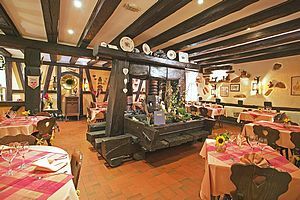 Le Caveau du Vieux Pressoir, with its warm and authentic setting, owes its names to an imposing eighteenth century wine-press, seated in the heart of the restaurant. 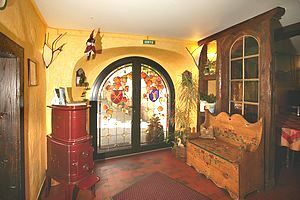 Christelle and Pascal offer you refined cooking and fine wines from the village and surroundings, for both lunch and dinner. For your family and business gatherings, Christelle and Pascal will be happy to help you make selections which will far surpass your expectations. Please, don’t hesitate to contact them !